Nigerian legend Nwankwo Kanu is tipping the Super Eagles to impress at the 2018 World Cup in Russia. Super Eagles captain John Mikel Obi hopes the team will better their performance of last Saturday’s encounter against England in today’s (Wednesday) friendly encounter against Czech Republic and possibly win the game too. 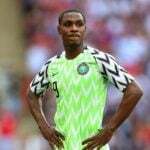 Viktoria Plzen new signing Ubong Ekpai has predicted victory for the Super Eagles against the Czech Republic this afternoon in a final World Cup warm-up game.